It is very evident that there are people—and civil leaders—from across the political spectrum that are intent on ensuring that divisive politics, crime, militancy, and racial and religious tensions are fuelled, and anger and dissent encouraged. Social media platforms and some mainstream media outlets are increasingly being abused, used, and exploited, to convey disinformation, lies, and hate speech. Social media abounds with official looking documents, along with dated photographs and video clips (often ‘posed’), sometimes accompanied by voice notes, and is being used by opposites across the political spectrum to further the aims, agendas, intentions, and false narratives of those who are sowing the seeds of panic and calling for an armed uprising in South Africa. Perhaps they believe that our country would be better off if it ended up looking like Afghanistan, Iraq, Libya, Syria, or Yemen? Perhaps they ought to read the story of agent ‘Curveball’ and how his disinformation, lies, and fake intelligence resulted mass damage, death, and destruction in Iraq? Elsewhere, the story is much the same…Is this the ends they are working for? Many of those who continue to call for confrontation, conflict, and war, probably have very little to no clue what an armed uprising and civil war truly involves. ‘Opinion makers’ should desist from hoping and wishing for conflict and civil war—they might just discover too late that their hopes and wishes have become reality as every action has an (often unequal) opposite reaction: this calls for thinking before speaking or writing. People should be wary who they accept their ‘news’ from. Blind acceptance of what we hear or read makes us mere sheep in the eyes of those driving the destructive agendas and narratives. Even more surprisingly is that some people believe that some ‘foreign ally’ will rush in to save the country when it is burning. It is time to seriously readjust that thinking as it is both foolish and delusionary—especially as some of these ‘foreign allies’ are aiding and abetting the growth of conflict in our country. It is perfectly understandable that not all of us share the same political, racial, or religious ideals, or view life through the same prism. We all have our own unique views regarding ethnicity, language, race, religion, politics, and so forth—after all, that is what makes us who we are. To merely watch and wring one’s hands, and allow the problems to take their (usually) criminal and destructive course is to transform evil and hooliganism into a ‘legitimate’ worse. It is equally irresponsible and criminal to fuel the flames of these lies, and feed the destructive narrative. Taking up arms may be one way of resolving the many problems we face but it is the most devastating option of all—and many of us have witnessed first-hand the devastation this brings. But, there are other options available—if only we are willing to look for them. Many mainstream and armchair journalists seldom disseminate ‘real news’. Instead, they create lies or ‘fake news’ to create negativism, demoralise people, fuel anger and hatred, and impart (or rather try to force) their warped opinions, views, and beliefs on others. After all, they need to protect the narrative they propagate. Many others swallow these deceptions and lies, and pass it on to anyone who is willing to read or listen to them—after adding their own spin, opinions and views to increase the fakeness under the guise of ‘truth’. Fanning the flames of conflict and war by blaming everyone else for our woes, and blaming the past for our present failures, is nothing short of refusing to take responsibility for our current position. It is said that when lies become the truth, there can be no turning back. We only have one country and we all have a responsibility to ensure that we do not go down the path of conflict and war. I would rather be part of an imperfect solution than part of the massive and destructive problem—where there will be no winner. 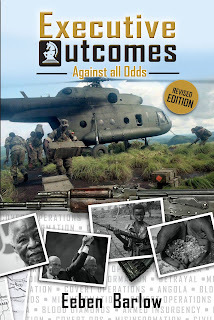 The book ‘Executive Outcomes: Against all Odds’ was finally signed off this morning and is due to go to print. Revising and updating the book was a bumpy and at times, a painful journey. However, a great editor and an understanding publisher made it easier to finally reach the end of the road. I am happy with the final result, and I hope the men who served the company so loyally will also be pleased with the end result. Obviously, it was not possible to mention everyone by name who served in the company, but those who served know who they are. They can be justly proud of what they achieved. The cover of the book was changed as the publisher felt it necessary to break from previous covers—including a book written by someone else that used virtually the same cover. My thanks to everyone who encouraged and supported me in getting to the end of this road. My thanks too to the Military Intelligence officers who found the courage to come clean and finally speak to me. I truly hope that the book will finally lay to rest the many ghosts of the past and expose the false and misleading ‘intelligence’ and ‘news’ for the lies they were.